On the second Tuesday of March, my 2009-2010 season of snowboarding went into its finale. In the company of my ever resilient and innovative snow sports buddy, an aging Bode Miller wannabe, I set out for glory in the White Mountains of New Hampshire. A perfect day with perfect weather, perfect conditions and no crowd. We chose a three-mile Blue intermediate trail from the top to start our day, a beautiful woodsy trail with pines, white birches and awesome views of snow-covered Mount Washington. I rode like a god. For over four hours, I charged the long, rolling novice and intermediate runs, putting on what I felt was a spectacle of performance art, of balletic grace and of adrenaline-fueled speed. There were several incursions onto the more challenging Black Diamond or “expert” runs where I now found myself handling this type of formerly anxiety-producing terrain with a new-found aplomb. I was atop my game and I kept going back out until I could hardly stand on my board. My partner and I, he’s a hot skier, got separated early, but periodically he would come rocketing past me at his signature mach-plus speeds. Not bad for a guy closer to sixty than fifty. When we finally quit for the day, both of us confessed to having nothing left in the tank. It had been one for the memory banks. I still am having trouble processing the reality of just what it is I am actually doing on a snowboard. I am in my early seventies and sad to say, I have never truly felt accomplished in any of the things I’ve set myself to do. Where I had some measure of success, professionally and academically, I’d always felt myself the imposter. Worse yet in my attempts at art and music, areas in which I earnestly sought self-definition, I had been forced after years of disciplined application to admit defeat. Only with writing have I come to feel a sense of a journeyman’s level of competence, but even there I remain plagued with doubts. I began skiing forty-six years ago, and despite showing no discernible facility for it, I found enough pleasure in it to persist at it for decades, finally reaching a skill level that might be generously rated “intermediate.” In my mind however, I knew perfectly well the tenuousness of that designation. I never skied with the confidence and certainty that is the hallmark of competence. My switch to snowboarding was marked by an even worse learning curve than the painful process I’d encountered in learning to ski, and I remain to a some degree genuinely clueless as to what accounted for my doggedness, despite the painful evidence of my unsuitability for riding a snowboard. In my twelfth season of snowboarding, the season before this one, I’d reached a skill level comparable to the peak levels of my years of skiing, but my riding continued to leave me far from satisfied. There were still too many white-knuckled descents of slopes I should have been able to competently and comfortably negotiate. But on a sunny morning in January a year ago, early enough that the lifts had just begun to run, at a smallish ski area in Pennsylvania’s Pocono region, I sensed that something different was happening, that I had begun to break through the invisible barrier separating me from my snowboarding dreams and ambitions. The snow that morning was crisp and groomed, a perfect corduroy-like surface, one as yet untracked by anyone’s skis or board. As I cut my third or fourth turn on the sunlit surface of the fresh snow, I experienced for what seemed the first time in my life, a sense of unflawed mastery in what it was I was doing, a feeling of seamlessness motion, a continuity of form, the perfect ecstasy that had eluded me in my over four decades of skiing and riding. The morning passed in dream of giddy self-awareness. I couldn’t believe that it was finally happening. And, I was alone with nobody to tell. Even when I began to tire, the level of my riding continued to peak, each run marking a new personal best. I didn’t stop for water, coffee or to take a leak. I continued to push out my own edge with every run until my body rebelled and I knew I had to stop or risk serious injury. Two days later I was back, a two-hundred-and-seventy-five-mile round trip drive, just to authenticate the near-miraculous experience of the previous outing. The first set of turns on my first run told me the transcendent joys of two days before had been no pipe dream. The rest of that season and all of this season have been an orgasmic continuum of new peak experiences. I kept pushing out my envelope, if only by the smallest of increments, I keep going faster, I keep staying closer into the fall line and I feel like my mind and body, my entire being, is instantaneously computing the dynamics of my descents in real-time at what seem to me to be astonishing rates of speeds. And I know that I am doing it with an elegance and grace I’ve never before known in anything I’ve ever done in my more than seventy-two years of being alive. There is a constant accompanying whisper in my head, rooted in an awareness of the utter improbability of what I am doing. It’s a voice of long, sad experience, one that keeps warning me that at any instant this could all come to a very bad end. I acknowledge the validity of the warning. I make note of it. But in the end I pay it no heed. How could I? Crashing for the night at a friend’s house just over the border between New Hampshire and Maine, we were up at first light to be back in New Hampshire, this time at Wildcat Mountain. In its New England purity, Wildcat Mountain can be a bit intimidating. I feel most comfortable on the Blue trails, the intermediate runs, which on many mountains can be less than advertised. Too many Blues can be ego runs, challenging in spots but largely made up of terrain more appropriate to advanced beginners than for truly intermediate skiing or riding. At Wildcat the intermediate runs are true New England Blues, not exactly the pulse-raising difficulty found on the Black Diamond or “expert” slopes, but challenging enough in their demands and intensity that you relax or take them lightly at your own peril. If you are not a reliably intermediate skier or rider, these babies will put some manners on you. 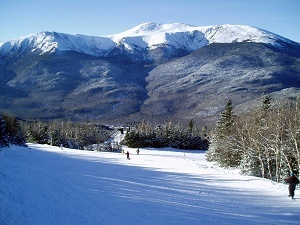 Feeling somewhat debilitated from my over-exertions of the previous day at Bretton Woods, I planned my Wildcat outing with energy conservation in mind. It would not do to go flat-out on my first few runs and have nothing left in the tank for the rest of what was probably to be my last riding day of the season. I thought, take it easy, Greens and Blues with frequent rest stops on each descent, moderation, a program of good sense befitting my advanced years. During our ascent on a quick quad chair, a twenty-one-hundred-foot vertical rise to the summit, my enthusiasm began to overcome my pledges of self-control. What a day, dead calm, bright, warm sunlight and what looked to be absolutely perfect snow conditions. Oh boy! Oh boy! With my rising euphoria rapidly undermining all good intentions of restraint, I followed my wildman skiing pal onto a long, twisty utterly gorgeous intermediate run, forested, exciting and unbroken from top-to-bottom. The instant rush of exhilaration that came with the first toe-side turn of my board, gripping the crunchy, sparkling surface of pristine, freshly-groomed snow, sealed the agenda for the day. For as long as I could sustain it, it was going to be flat-out, balls-to-the-wall, screaming, non-stop, adrenaline-pumping fun from summit to base. Gathering my wits I realized that I had to tone this thing down if I were not going to burn myself out in the early hours of the day. On my buddy’s advice, he’s an old Wildcat veteran, I chose “Polecat”, a full twenty-one-hundred-foot vertical, top-to-bottom Green run, a run in three distinct segments, Upper, Middle and lower Polecat. My friend briefed me that while Polecat was rated “novice,” I should not be too complacent in running it. Polecat he asserted, had an “intensity” to it, and I would be wise to spend a few runs just trying to get a good read on it. Sound advice. What I discovered was that Polecat was filled with little surprises, all of them fun. Each of the three segments contained interesting variations of drop, of terrain and of difficulty. Nothing extreme, but always enough to keep me alert and focused. After three runs, I was ready to show Polecat some of my newfound performance art, some figures, arcs, rhythms all executed within a context of reconciling the antithetical concepts of speed and control into a harmonious synthesis of form and grace, a creative act, a work of art if you will, all kinesthetic connectivity at brain-melting speed. Each turn became a small jewel of excitement and pleasure. With my heel edge engaged to control my downhill slide, I look to my left and pivot my upper body, turning the board across the fall line while transitioning to my toe-side and engaging that edge to better control my speed as I traverse across the face of the downward slope. The physical movements are an unbroken stream, sinuously fluid and effortless. Accelerating rapidly, I turn back across the hill, the time between turns shortens to eye-blinks as I go faster and faster. I am still in control of my descent, but just barely. I’ve entered a zone of personal transformation and transcendence. My grown son, no mean snowboarder himself, noted that when I start going on like this, getting all cosmic about snowboarding, I sound like one of those glassy-eyed old surfer dudes. The day ends too quickly and with it, my season. I feel much like an old golfer, a duffer, who after a lifetime of dragging his clubs around the course, suddenly finds that he’s consistently hitting that sweet spot on the ball. That old golfer knows he’s never going to make the tour, and I know that I’ll never ride an X-Games half-pipe. But that’s of no matter at all. While my snowboarding, like all such things worth doing, will continue to be a work in progress, I do have difficulty believing it can get any better than it is now. Again, no matter. If I just keep can snowboarding, if I can get in just one more season, or even a part of one more season of riding, I go out a champion, smiling and without a complaint.